£50 non refundable deposit to secure date and an additional £70 security bond added to the total cost of the holiday (£100 if bringing pets) which will be refunded after 7 days of departure if no breakages and caravan is left clean and tidy. Full holiday is payable 6 weeks before holiday start date, payment plans are available, please ask on booking for details. 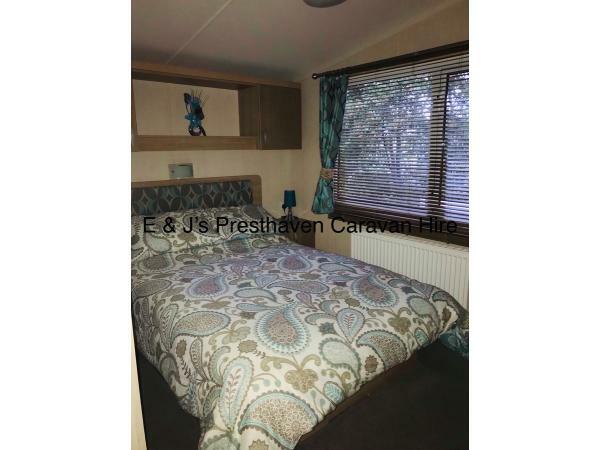 Welcome to our prestige grade caravan which is situated in a quiet court at the edge of the park next to the sand dunes and approximately 8 minutes walk or 2 minute drive from the entertainment facilities (shuttle bus also available for those who do not wish to walk). Beautiful location, perfect for a relaxing holiday for people that want to be away from the busy crowds yet still be on a site with all the facilities that a Haven site offers. 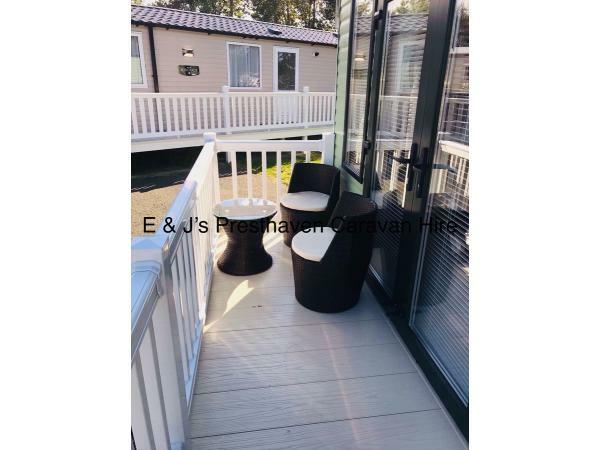 The caravan is fitted with gated decking perfect for sitting out on a warm day on the rattan garden furniture to the side and to the front along with a well sized garden area and off road parking. Our caravan is located on Snowdonia Court and is not overlooked having no caravans in front, ideal location for children being safe and secure. The lounge has a modern style decor with 43" TV/DVD and Freeview with a selection of children's and adult DVD's, Xbox and board games. The sofa can convert into a double bed if required. The kitchen area is fully equipped with everything you will need including gas oven/hob, microwave, toaster, full size fridge/freezer and all crockery and utensils. There is a free-standing dining table. The spacious double bedroom has an en-suite toilet room. It has a 32" TV/DVD with Freeview and built in wardrobes with plenty of storage and hairdryer. Two further twin bedrooms both with TV/DVD and Freeview, wardrobes for storage. Family bathroom has storage cupboard and large shower. Travel cot and high chair also provided. There are plenty of onsite activities including 2 indoor pools, one with a water slide and an out door pool and a lazy river, there are 2 show bars and also a pub/restaurant, there is crazy golf, go carting, a high wire obstacle course, amusement arcades, football pitch. They also have a day and night time entertainment programme as long as you have bought the passes then you can join in all the activities. You will never be bored here and will find something to do for all the family, even beyond Presthaven there are lovely parts of North Wales to explore. Please note when comparing prices that bedding is included in the price. Check in time is 2pm onward. £50 deposit to secure your holiday dates. Holidays can be paid for in instalments and the total price must be paid at least 6 weeks before the date of your stay. In addition to the total holiday cost there is a £70 refundable damage/breakages security bond (£100 if you are bringing pets) which is on top of the total holiday cost. 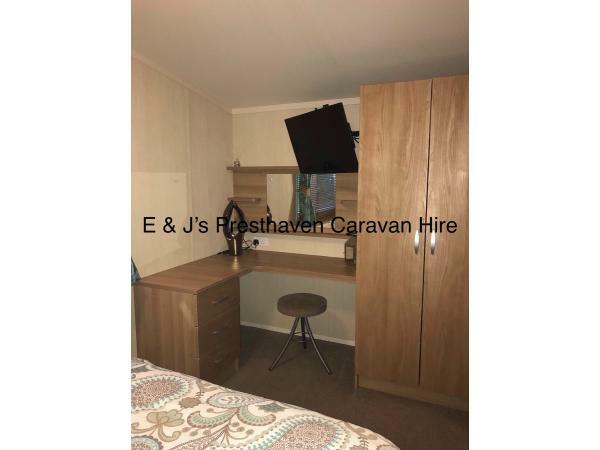 The security bond will be returned to you within 7 days of departure providing that there is no damage/breakages and that the caravan is left clean and tidy with rubbish removed. Haven funworks passes are not included in the price but can be purchased from reception on arrival. Stays are Saturday-Saturday, Friday to Monday or Monday to Friday. I can accommodate different lengths of stays and sometimes different start days if you contact me. Please note there is a strictly no smoking policy. This is only the 2nd time we've stayed in a caravan with our 6 year old chocolate lab. We needed somewhere we could relax with peace and quiet, we certainly got that. From our initial enquiry through to the end of our stay Emma has been exceptional. Very easy to get in touch with and very helpful. On entering the caravan we noticed how warm, clean and comfortable it was. It was spotless and in very good condition. A fully equipt kitchen. It was most definitely home from home. My dog doesn't usually settle very well in unfamiliar places but he did here. We will definitely be returning and Emma will find us being regulars going forward. Thanks again Emma. Thank you for such lovely feedback and I am really happy that you all enjoyed your stay with us including your fur baby, we would welcome you back anytime! Visited with my 4 dogs which I normally find it hard to be able to rent anywhere. Emma was very helpful and made it not a problem. Position of caravan great plenty of space and not overlooked. Very easy to get to some great walks coastal and the beach . Most stuff on the site shut but that suited me. Very convient to get to Llandudno Conway and many more . Walked to the point pub along the beach allows dogs and lovely meal. Will be returning to this great caravan which was exceptionally clean and well equipped. Thank you for such a lovely review of our caravan, we are really pleased that you and your dogs enjoyed your stay and hope to welcome you back in the new year! We have stayed in many caravans on Presthaven but this is by far the best. It was immaculate and cosy when we arrived. Emma very kindly left the heating on low for us so it was toasty warm as soon as we entered. Lovey outdoor seating area and car parking. Emma was so helpful throughout, answering our emails right away. Anyone thinking of booking this caravan, just do it. You won't be disappointed. Thank you for your lovely feedback we are really happy that you enjoyed your stay and hope to see you again in the new year! I can’t recommend this enough, we’ve been and stayed in a lot of holiday homes over the past few years and non of them come close to this. The Caravan was immaculate, really homely and perfect for a nice break with my family. We only stayed for two nights but we’ve booked again for January for four nights and will also be booking a week for summer next year and maybe some long weekends too. I don’t think Emma will be able to get rid of us now. Amazing customer service from start to finish. 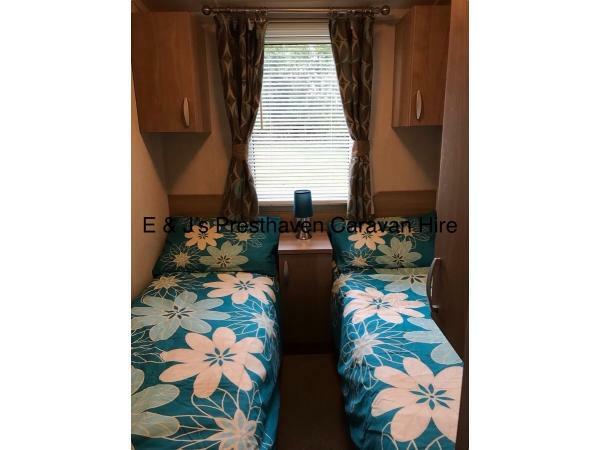 I have a four year old a one year old and two dogs, the caravan has plenty of room for a large family. I honestly can’t rate it high enough. Even though some of the site facilities were closed down for winter there was still lots to do in the local area, we had a short drive to the zoo and also aquarium, some nice long walks on the beach. Perfect location. Looking forward to lots more holidays here. Thank you for a wonderful stay. Thank you Rachel it was a pleasure to have you and your family stay in our caravan and we are so pleased that you enjoyed your weeeknd break, looking forward to welcoming you back in the New Year! Thank you again for the lovely feedback. Last minute booking and so glad we did.What a wonderful very clean & roomy caravan. We usually take caravan holidays but this caravan was certainly the best one we've been in.It was certainly like home from home. In our opinion it's sited away from the hustle and bustle, ( thank goodness ) very peaceful and safe for kids and dogs.Would not hesitate to book again. The booking was easy and pleasant with no problems at all. Thank you very much Emma, and we will certainly recommend your caravan to others. We’ve been in about 20 caravans at least over the years coming back to Wales visiting family , originally from Prestatyn. We have been in some very nice caravans, this one was our favourite by far. Very homely, very clean and great facilities and friendly service. Hope to come back to this one . Thanks for such lovely feedback we are really happy that you enjoyed your stay with us and we hope to welcome you back again! Great caravan, everything we needed, perfect for small children and dogs. We had a fantastic weekend. Thank you for letting us stay in your beautiful place! Thank you for the lovely feedback we are really happy that you enjoyed your break away and look forward to welcoming you back next year! 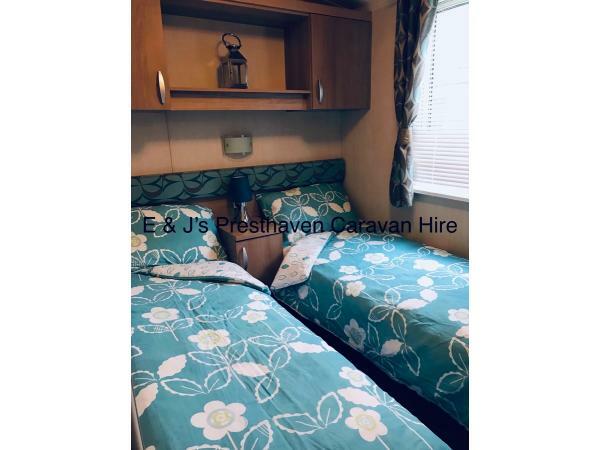 The caravan is in a great location and quite so if you have small children it’s great and for the dogs, I took my small dog with me and the space at the front and back of the caravan to take him for a walk in the morning and at night was great. It was really easy to find space to park your car right next to the caravan (which I prefer than parking further away from the caravan), it is really modern and it was very clean. We stayed with our 2 young daughters and the facilities onsite were brilliant! Would recommend to anyone, we have already booked for 2 weeks next year! Fantastic few days away , caravan was immaculate and a credit to the owner. A real home from home with everything you need. Bedding , tea towels were included and were excellent quality. We shall certainly book again .